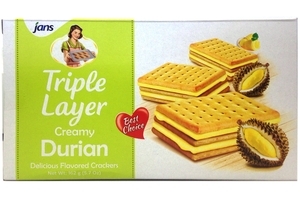 Jans Triple Layers Crackers (Durian Cream Flavor) in 5.7oz (162 g ) box. Delicious durian flavor crackers is the best choice. Product of Indonesia. Halal Certified حلال . Wheat flour, vegetable oil, sugar, milk powder, salt, leavening agent, cheese powder, durian flavor, food color.